Liberal, Lesbian, Activist On Fox News? 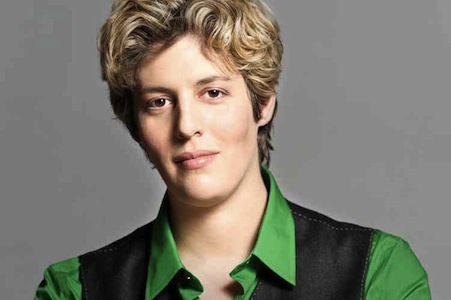 Meet Sally Kohn. Sally Kohn is a veteran community organizer turned political commentator, and is interested in movement building for equality and justice. Last week, Kohn officially joined Fox News as a contributor. Role/Reboot co-founder Nicole Rodgers talks to her about what it’s like to be a lone wolf progressive amidst the conservative pack. Nicole Rodgers: First, congrats on your new gig. A lot of people seem very surprised that Fox News has hired an actual liberal activist who is also—gasp—a lesbian! Does this suggest Fox is genuinely interested in representing different viewpoints, or do you feel you’ve been asked to play the foil for conservatives in a way that stirs ratings-driven controversy? Sally Kohn: Look, Fox News makes no bones about its opinion programming being center right-leaning. I actually think that’s refreshing—you know where they stand. But they certainly don’t put me on air and tell me what to say and tie my hands. They want a good fight on the issues and they want good progressives who are standing up for our side. More often, I think the problem is that good progressives refuse to appear on Fox, which seems to me a wasted opportunity. You know that old joke: Why do people rob banks? Because that’s where the money is! Well, Fox News is where the largest audience is. Why wouldn’t we want to speak with them and engage? I’d also add that community organizing—where I got my start—and television are strikingly similar. What makes a great direct action and what makes a great TV news show is generally the same thing: dramatic tension. If you can present an issue in a compelling and captivating way, you’ll get more attention. That’s what Fox News does really well. NR: Some on the right are organizing campaigns to smear you, and attack Fox News for hiring you. Does that kind of thing bother you, or is having a thick skin part and parcel of being the lone liberal on a conservative news network? Do you ever feel threatened in any way? SK: Usually it cracks me up. Who knew I was so powerful? Most of it I find fascinating more than anything—the smear pieces about me that point out I was once at a meeting with so-and-so and allege that I must agree with everything that person has ever done. It’s bizarre. Then some of the hate mail is more disconcerting. The sheer amount of it that isn’t just critiquing my ideas but me as a person—laden with sexism, homophobia, and anti-Semitism—is shocking. Anyone who thinks discrimination is dead in America should read my inbox! But I assume that for every one hateful person out there, there are at least a hundred more reasonable people who appreciate my points. I should also add that I’m certainly not the only liberal on Fox, not by far. I have some great colleagues on my side of the ring, from Jehmu Greene to Alexis McGill to Erica Payne to Bob Beckel to Joe Trippi. I guess we must be doing well if the activists on the far right don’t like us. NR: I suppose that’s true. Speaking of which, I learned recently from a conservative website that your perch at Fox News will finally allow you to champion your “radical Arab and pro-Marxist causes.” Could you elaborate a bit on what those are? Seriously though, what issues do you hope to be able to devote more airtime to? SK: Everything has become so hyper-partisan. Partly, what I want to do is just humanize progressives—not just throw out statistics and argue, but show conservatives in this country that progressives really care about their struggles and their suffering and that we offer a different plan, one that we think will get them out of the economic hole they’re in rather than continuing to make it deeper. At the same time, I hope to show liberals that appealing to mainstream America doesn’t mean letting go of your core beliefs. In fact, on issue after issue—from taxing the rich to marriage equality—the vast majority of Americans are on our side. I think we have to do a better job of showing we’re on their side, which can only be achieved through authenticity, warmth, and connection. NR: You’ve been debating a lot of conservative pundits lately. What do you think are the biggest misconceptions that progressives have about conservatives and vice versa? SK: I think the misconceptions are similar in both directions: the idea that the other side just doesn’t care about people or are stupid. For me, it’s been eye opening to meet some of the biggest conservatives in the country and see most of them as normal, decent human beings. Maybe that sounds naïve, but the fact is they love their kids just as much as we do, they’re saddened by poverty and suffering, they’re sensitive, if you prick them they bleed, all of that. Especially within the professional left and right, we can become so encased in our bubbles we don’t spend enough time hanging out with those who don’t agree with us, let alone trying to understand their viewpoints and find more strategic ways to counter them or even, perhaps, find common ground. At the very least, know the enemy. At best, get them to buy you a beer! NR: Do you find it hard being part of a network that has expressed so much disdain for your political views and personal values? SK: I think the network as a whole is much more complicated. Fox has the highest percentage of independent viewers, yet I find that a lot of liberals who criticize Fox have never watched the station. Or they’ve only seen clips of O’Reilly or Hannity, which are very explicitly sold as opinion shows and thus are the extreme examples of slant at Fox. The dayside programming, for instance, is more varied and news focused than I realized before I’d ever really tuned in. From Bret Baeir to Shepard Smith to Megyn Kelly, a lot of progressives might be impressed if they really tuned in and saw the hard-hitting and insightful reporting. Look, I chose to go to Fox because I thought I could make a difference there. So by definition, I think making that difference is needed. Every time I see a pundit on Fox say something anti-gay or fan implicit racial bias or slander Occupy protesters as unwashed communists, it makes my skin crawl. But I sure prefer being able to respond directly rather than just screaming at my TV. And ultimately, I’m grateful Roger Ailes is making an investment in my career when he could just put a weak, unpersuasive liberal on TV instead of me. NR: Do you believe your presence on the network has the ability to change hearts and minds, as the saying goes? SK: Every time I get a letter from someone watching who says something like, “I’m an independent and I didn’t really know what I thought about that topic until you explained it,” or even, “I’m a conservative and I don’t agree with you about most things, but I thought you made some good points and made them well,” I figure that’s a sign I’m making a difference. My job is to help lead people away from the Kool-Aid and toward a refreshing vision for a better future—but I can’t make them drink! NR: What does your daughter think of your new gig? Does she get to watch Fox News? SK: It’s hysterical. My daughter, Willa, is 3. The first time, a year ago, she saw me on TV and completely lost it because she was trying to talk to me on the screen and I wouldn’t respond to her! She doesn’t watch ever, but she’s in a super-frilly princess phase and absolutely loves when I come home with TV makeup on. Delights her to no end.